The Forward, the 121-year-old Jewish-American news publication, which originally began publishing a Yiddish-language daily newspaper in New York City in 1897, is suspending its print edition. The news, which was reported by the New York Post, comes a year after The Forward dropped its weekly print edition and began publishing in print monthly. NYP also reported The Forward is laying off about 40% of its editorial staff, including its Editor-in-Chief Jane Eisner. 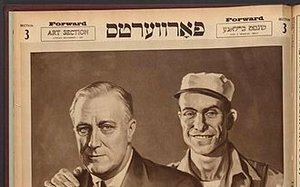 The Forward, which was originally known as Forverts, the Yiddish word for forward, first began publishing an English-language edition in 1990. The publication has experimented with a variety of formats and publishing models. It has operated as a not-for-profit with a healthy endowment created by the sale of its New York radio station WEVD to Walt Disney Co.’s ESPN division in 2004. In its heyday in the 1930s, the Yiddish-language edition had a circulation of nearly 300,000. Earlier in its storied history, the Jewish Daily Forward boasted a readership larger than The New York Times. The newspaper once distributed 11 local and regional editions, reaching as far west as Chicago. The Forward published stories and serialized novels by notable authors, including Nobel Prize winner Isaac Bashevis Singer.